One of the most popular sports of the present is fishing. Fishing is a great way for the individual to enjoy a hobby or explore a new sport and is relatively inexpensive. However, for those who are seasoned veterans of the lakes, streams, and oceans, fishing is more than just a hobby. For these same people, fishing gear is not something purchased at some cheap department store. Equipment and gear must be of the highest quality and in top notch condition. The difference between a serious angler and an amateur is the small things he or she does to ensure the fish is landed. 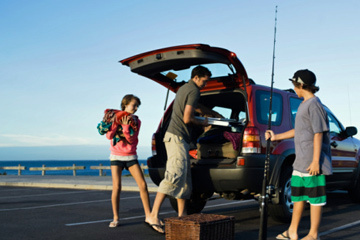 Fishing gear plays an important, if not the most important, role in that aspect of fishing. Fishing for salmon is a bit different than fishing for other game fish. For this reason, one should always have the right rod and reel. For most, the right rod and reel outfit is not a conventional or bait casting setup but a spin-cast outfit. Spin cast outfits are very effective for casting from shore or boat. Spinning reels also allow the angler to leave the bell open, which does not let fish know they are hooked. Spin cast reels are also great for salmon for their retrieve ratio although one should make sure he or she has a large enough reel. Line capacity is important for salmon fishing, and one should have at reel that can hold 175 yards of 12 pound test. This ensures that the angler will not get spooled. Rods also need to be durable, strong, and flexible. A large salmon can snap a light weight rod in half when running downstream in heavy rapids. For fishermen and women who wade rivers and streams searching for the elusive salmon, he or she will want a good pair of waders. Salmon live in cold water environments, which are normally too frigid for exposed humans. Waders are a must when fishing in cold water because they allow the angler to venture farther into the water without freezing. The best waders are those that use neoprene. These are the warmest and also allow for the most range of motion without being too bulky. There are a number of baits to use when fishing for salmon. Natural baits such as herring or smelt are a great way to attract salmon. Another popular method is to use a spoon spinner. A spoon spinner is a spinning lure that has a spoon attached to a pivot. Ask at the local bait shop for what the salmon are biting on for that particular season. Although some salmon gear may be expensive, those new to the start should inquire at their local tackle shop about entry level outfits of quality. This will allow one a more economical way to approach the sport without such a large upfront investment.